Faculty and industry connect is an essential element of pedagogy. B-schools’ need to be connected to industry and the faculty base is a prime means for the same. The views, ideas, and expertise of the faculty reflect the minds of students as they themselves mold it. To promote and share the views, opinions pieces of faculties in different print and digital media on the latest topics. To leverage faculty brand identity to build institution image, and corporate connect. Pursued and Posting of highly qualitative pieces of content of faculties published in news media report over social media platform. Cross Promotional strategies to share social media post. 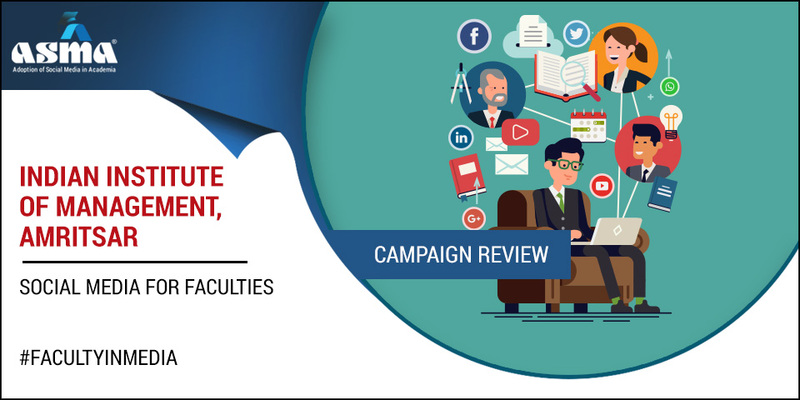 #FacultyinMedia is a unique campaign run by IIM Amritsar to cite the articles published and views expressed by the faculty in the national daily. This helps in providing a peek into the mind of eminent leaders who mold the minds of future leaders and form one of the main pillars of an education institute. IIM Amritsar uses this as a point to start a conversation about what the eminent faculty expressed. The idea when associated with the fact that the author is a faculty at IIM Amritsar helps in branding of the institute. Newspapers play an integral role in the lives of corporates and that of MBA aspirants. In the present case, showcase the ideas of faculty, hence the campaign is a unique way of promoting the quality of faculty, not only among aspirants and world but also corporates and alumni network. Social media now connects people with news and affairs across the world and is soon becoming a critical place, to not just express opinions, but also a platform for getting a daily dose of news. For corporate connect it helps to highlight the quality of pedagogy to the industry experts thereby helping the promote the academic rigor and the value addition that the classroom learning has. For the students aspiring to join top B-schools, it is a glimpse of the quality of exposure to thoughts and facets that await them on joining IIM Amritsar. The novelty of idea to showcase the articles of faculty is an innovative approach to showcase the quality of faculty, the learning experience & thought transformation that the students undergo during their time at IIM Amritsar. The post covers the media coverage of faculties opinion, views, articles in any newspaper or journal. These posts express in the digital news media and the link has been shared in the post to understand the full context of the post. Twitter engagement is slightly on the higher side than Facebook on these posts. Majority of people are actively participating via retweeting the same content. The respite of limited character on Twitter, post looks very sound to understand the overall context. Tweet and Retweet, again and again, that’s the strategy need to opt for post knowledge are being shared. The idea of posting on LinkedIn can be inferred through the content of the post. LinkedIn considers to be industry inclined platform, posting such high-quality content, makes the engagement and potential reach at a high level. Content would have chances to get a high level of appreciation and being consumed by the right audience. IIM Amritsar post about faculty aimed to ensure that it reaches out to right audience including corporate to know and understand the quality of thinking process at the campus. The idea can be extended to students’ accomplishments too to give the idea of successful thought and learning transfer from faculty to students.